Similar to what followed Divela's murder, Iddrisu received a wave of solidarity from journalists and private citizens. 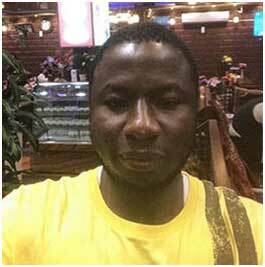 The hashtag #JusticeForLatif flooded social media, but there has been no justice: "he perpetrators are yet to be identified but the case docket has been forwarded to the Attorney General's office for advice," Ghanaian police spokesperson David Senanu Eklu told CPJ recently, 10 months after the attack. In the case of Divela's murder, local witnesses had watched his killers--one heavyset and one slim--loitering for hours on January 16 in the Medina neighborhood of Ghana's capital, Accra, confused about who they were or what they wanted, Darko told CPJ. Agyapong's threats came days before the premiere of Anas' film "Number 12"--which featured Nyantakyi accepting $65,000, resulting in a lifetime from ban FIFA, and is now part of a corruption investigation by the Ghanaian government, Darko told CPJ. Divela had been assisting prosecutors, the lawyer said. "If the police had dealt with that assaulted me, it would have sent a strong message," Iddrisu told CPJ this month. "Because they failed to act, people think they can break the law, they can assault journalists, and even go to the extent of killing a journalist and get away with it...now my brother, a colleague, is shot and murdered in cold blood...it's heartbreaking." Dogbevi, from Ghana Business News, told CPJ he also believed the lack of accountability for attacks against journalists would encourage more violence: "Unfortunately, I don't feel confident in the ability or willingness of the state to protect me--the example of Latif Iddrisu says all."